The outdoor work of Christo and Jeanne-Claude transformed the way we view and engage with our landscape and architecture. 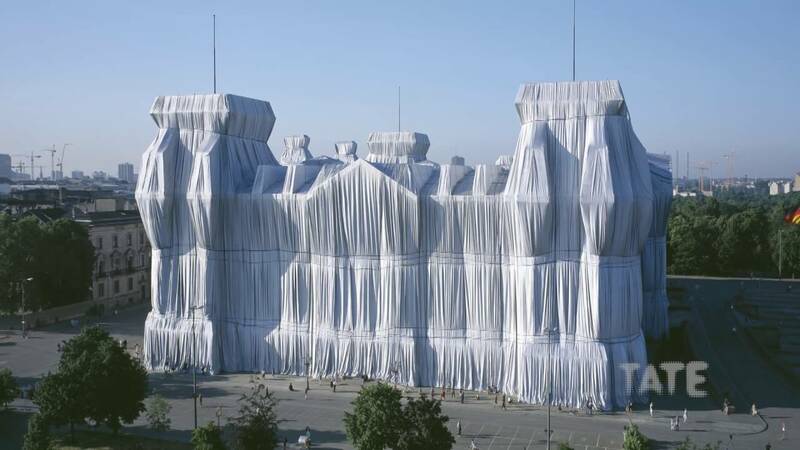 Though Jean-Claude is now dead, Christo still works under their joint name. Working on a grand scale, he has built giant sculptures made from stacked oil barrels. He has also created fabric curtains that go on for miles and wrapped architecture in silky fabrics, even once wrapping a coastline. The London Mastaba is a giant temporary sculpture comprising of 7,506 horizontally stacked oil sized barrels and was located in London’s Hyde park. This created a patchwork of red, blue and pink circles. The whole work was placed on a floating platform. It is 20m (65 ft ) in height, 30m (98.5 ft) wide and 40m (131 ft) long. A Mastaba was an ancient Egyptian tomb that had a flat roof and sloping sides. Christo hopes to go on to build one in Abu Dabi. This super massive Mastaba would require 410,000 barrels . At 150m (492ft) high, it would be the largest sculpture ever made, it would be a bit taller than the Great Pyramid of Giza, or the London Eye which is 135m tall. The work would cost an estimated $300 million. It will be Christo and Jeanne-Claude’s only permanent large-scale work. Jeanne-Claude was born June the 13th 1935 in Casablanca, Morocco. In 1953 Christo began studying art in the Bulgarian Capital. Bulgaria was communist at that time. He always dreamed of going west to indulge in the Paris art scene. In 1956 whilst in the communist Czech Republic, he bribed some boarder guards and managed to sneak into Vienna. He eventually arrived in Paris, where and made a living painting portraits. He is actually a very accomplished painter. He met Jean Claude in 1958 when working on a portrait of her mother. Christo began to wrap objects in about 1958, he started off small, wrapping everyday objects such as shoes, telephones and empty paint cans to make his sculptures. This 1958 wrapped bottle is a good example of an early work. His works gradually became larger in 1961 when he wrapped a motorcycle. When he wrapped an object it would be transformed. All you would see would be the basic shape and size of the object. By wrapping an object it became a new sculptural form. On the 27th of June 1962 Christo closed off a Paris street. He did this by building a wall from 89 oil barrels on their side stacked on top of one another. He did try and seek permission from the local authorities to do this, but it was not given, so he went and did it anyway. For 8 hours it blocked off a street. Eventually Christo and Jeanne-Claude were summoned to the Police station for illegally blocking off the street, but no charges were ever brought. A picture of the work is here. There is a lot of man power and work that goes into making a Christo work. He creates drawings and collages to sell to finance the project. This also to shows people what the work would will look like. A lot of time is spent getting permissions from local government authorities and winning over the local populations to the ideas. In 1985 Christo covered the Pont Neuf in Paris, in a beige fabric. Pont Neuf is the oldest standing bridge in Paris and was completed in 1606, throughout history there have been several painters all giving there view of the bridge. By wrapping the bridge it would transform the object into a work of art itself. The Bridge wrapped in fabric completely changed the way that people interacted it with it, it encouraged people to stop and talk about it. It was only up for 14 days. Scale. The amounts and scale for his works are incredible. Running Fence was a white fabric nylon wall that existed for 14 days. It was situated north of San Francisco and stretched across the property of 59 ranches and dropped down into the Pacific ocean. The White Curtain was 5.5 metres (18 ft) high and 39.5 km and about 24.5 miles. The artwork used 145 km (90 miles) of steel cables 2060 poles and 14000 earth anchors. It was designed in such a way that once removed it would leave no environmental trace. The Umbrellas was a simultaneous installation of giant umbrellas in the USA and Japan. It consisted of 3100 Yellow and Blue umbrellas. They covered over 19 km (12miles) of landscape in japan and 18 miles in the USA…. This was an extremely costly project and cost $26 million…. In 1995 Christo and Jean-Claude wrapped the German parliament building called the Reichstag. It was extremely popular and was visited by nearly 5 million visitors. A TV used by the artist Naim June Paik and wrapped by Christo was accidentally unwrapped by a gallery. Christo and Jeanne-Claude, work outside of the gallery system and raise capital and organise the sale of their work themselves. This allows complete artistic control of the work. We started our conversation today about Lucy Delano and her contemporary dissertation for her MA. It was titled 5000 words about art and consisted of the sentence “5000 words about art” being repeated until the word count had been reached. Also if you want to find out more a previous podcast featuring a short discussion about the Artist can be listened to here. 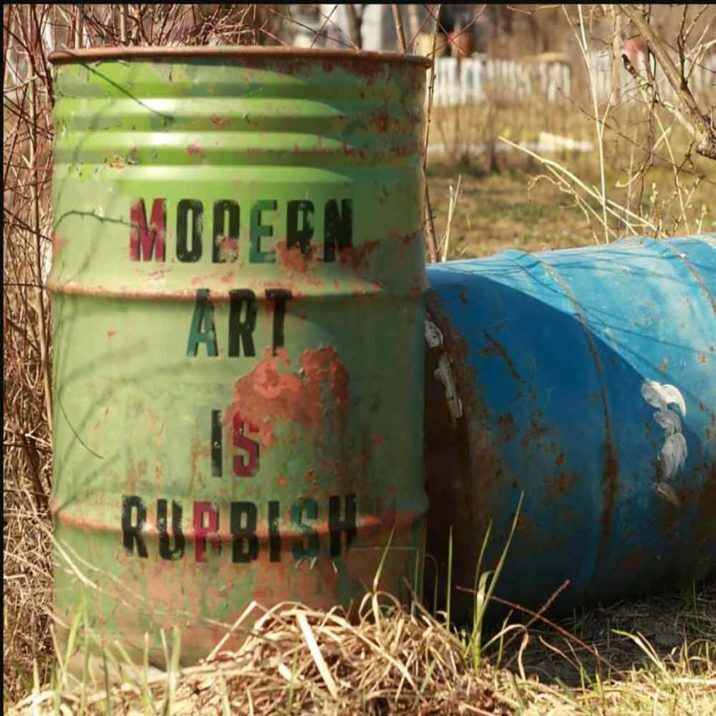 Join in the debate with the Modern Art Is Rubbish podcast. Lots of people like to support our show by leaving a little tip.